Is your business's conference room boring and drab? Dress it up with custom wallpaper. A beautiful wall mural hung in your conference room will help elevate the creativity of your employees, as well as certainly impressing your clients. Be it in a home or office, our wall murals are able to transport the viewer visually to another place, which never fails to amaze. The conference room above is located in New York. The decorator wanted to create the feeling of being in Central Park, surrounded by green with the New York cityscape peeking out above the trees. As the installed photo demonstrates, the look was quite literally and successfully achieved with panoramic wall murals that line the walls all around the room. A purposeful image can create a visual theme related to your business. A mountain range can create a feeling of stoic solidity. An arch can give the feeling of creating connections. 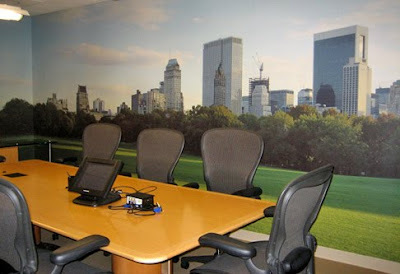 Whatever your business's direction, there is always a coordinating wall mural image to correspond harmoniously with it. Ready to take your board room or conference room to new heights? Contact us to start your custom wallpaper project today.